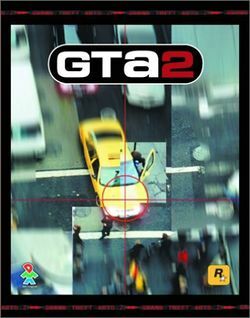 Mock police records on the [[Grand Theft Auto 2]] website are dated between 10/07/13 and 03/11/13<ref>http://www.rockstargames.com/gta2/journal/journal_frame.html</ref>. This, along with the game's futuristic setting lead some fans to believe that the game takes place in 2013. 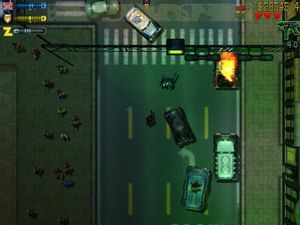 However, the game's manual uses the phrase "three weeks into the future", and the website's clock is always set three weeks ahead of the current time<ref>http://www.rockstargames.com/gta2/frameset.html</ref> - this puts forward the idea that the game takes place in an unspecific time and place, fitting with the game's setting of "[[Anywhere City|Anywhere, USA]]". On top of this, radio host [[Johnny Riccaro]] mentions in the game that "the millennium's coming," which would set the game shortly before []. * This is currently the newest GTA game in chronological order, with Grand Theft Auto: Chinatown Wars right behind it.